Bob's Burgers Season 7 & 8 Coming | Nerd Much? FOX has announced that the network has renewed the hilarious Bob’s Burgers for two more seasons (Seasons 7 and 8). “Six seasons in, the Belchers have become one of America’s most beloved TV families, and we are so happy to keep them in the fold for another two seasons,” said FOX President of Entertainment David Madden in a statement. 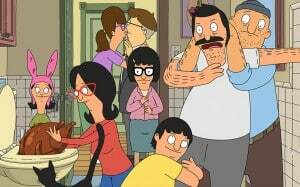 The Bob’s Burgers cast includes H. Jon Benjamin, John Roberts, Dan Mintz, Eugene Mirman and Kristen Schaal. The show follows the many adventures of Bob Belcher and his family-owned burger restaurant. The series, which just started its sixth season, airs Sundays on FOX alongside Family Guy and Brooklyn Nine-Nine. The show was nominated for two Emmy Awards in 2015, and was the winner of the 2014 Emmy Award for Outstanding Animated Program. Want more from The Belchers? Check out our ultimate list of the best Bob’s Burgers episodes here.